Is your restaurant monitoring its SEO strategy when it comes to online food delivery ordering? If not, takeout aggregators like GrubHub and Caviar may be exploiting your eatery’s name and reputation to fuel their growth. From mom-and-pops to national restaurant chains, online takeout ordering platforms are employing questionable business practices on a gluttonous quest for more orders. Read on to see examples and learn what you can do to protect your brand. Lesson: A restaurant should avoid doing business with any service seeking to take the customer relationship out of the hands of the restaurant, unless the restaurant wants to become dependent on the service for survival. 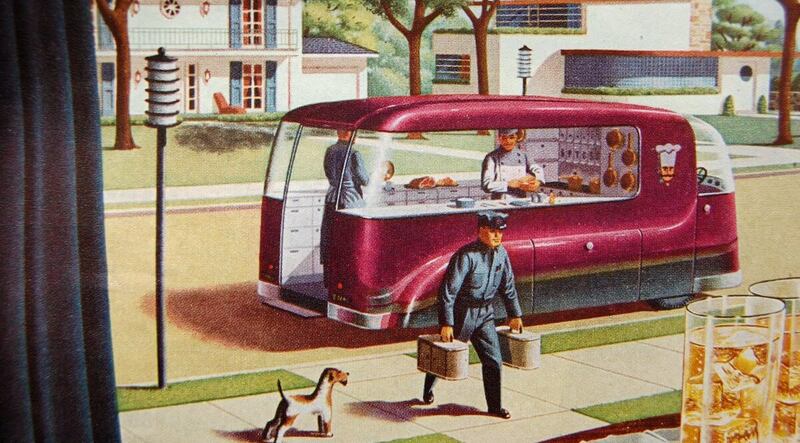 Cut to present day and restaurants are again facing a similar proposition. Only this time it is takeout orders not reservations. With minimum wage going up, food prices going up, healthcare costs going up, and profit margins already razor-thin, restaurants can ill afford another colonization. Customer Data: Platform owns all data it collects. Examples: customers’ name, gender, email, phone number, delivery location(s), order histories (i.e. who orders what, when, where and how), preferences, browsing histories, contacts (i.e. friends, associates, and family members) and more. Platform determines who, what, where, when, why, how, and if any data collected will be used or shared for its maximum profit. Yes, the platform may share some order data with restaurants, but the platform gets to define “order data” (read the fine print). 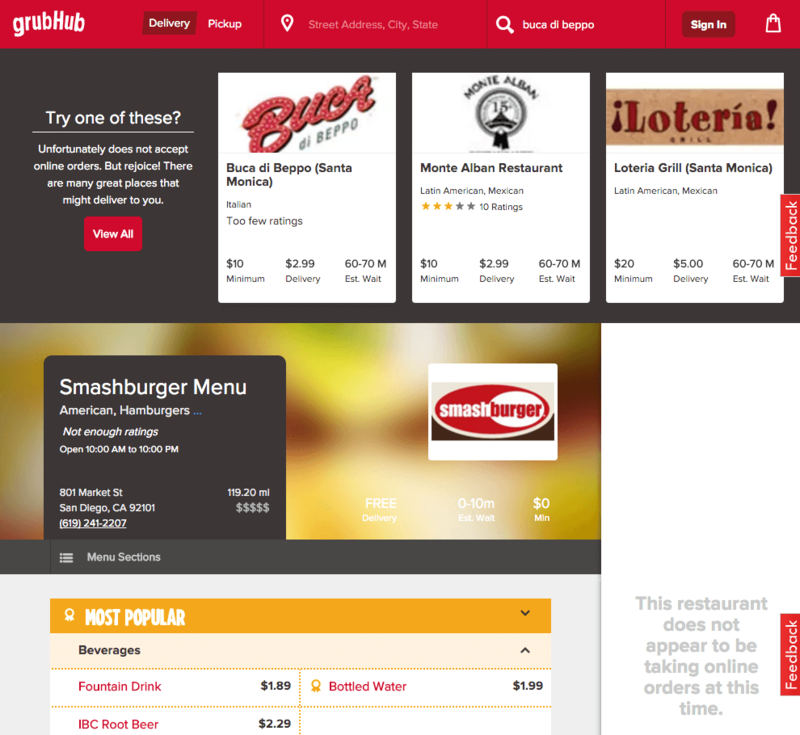 Restaurant pick-up and delivery ordering platform GrubHub creates restaurant profile webpages with search engine optimized URLs containing relevant keywords for existing restaurant locations not in business with the platform. The URL often contains the restaurant’s name, street address, and city, increasing the link’s relevance in local organic search results. In many instances the profiles’ meta descriptions contain deceptive, but search-relevant text, also increasing the likelihood for each profile to rank higher in unpaid Internet search results. The intent appears clear: trick customers into believing they can order delivery online from the restaurant in the search result via GrubHub. Mere seconds later after clicking the search result link the customer learns the instant gratification offered is not actually available from Smashburger. Might this offer and withdrawal of instant gratification create a negative association in the customer’s mind towards Smashburger? If so, what will the present and future cost to Smashburger’s business be from this negative association? 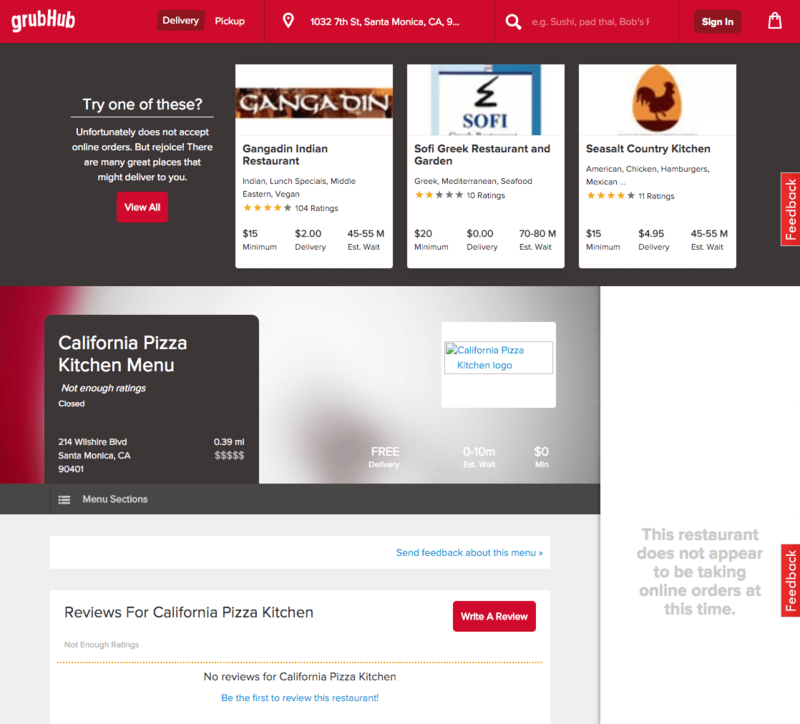 Although the misleading restaurant profiles are made available for indexing by web search engines, the pages are hidden from customers’ view on GrubHub’s internal site search. The result can cause turbidity in local unpaid Internet search results on Google, Yahoo! and Bing for restaurants not in business with GrubHub. Click images to visit the misleading restaurant profile. 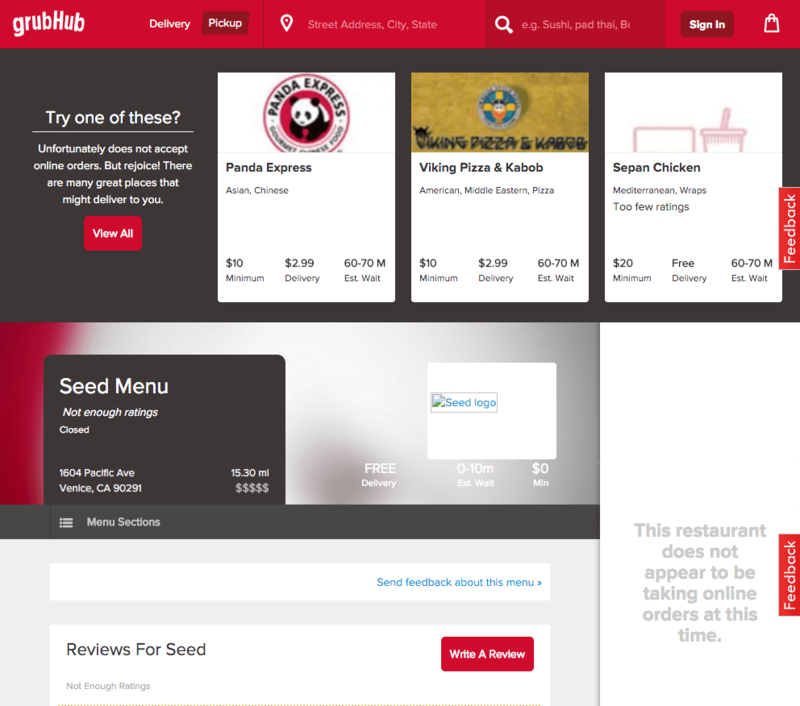 GrubHub’s misleading profile for Seed in Venice, CA incorrectly lists the restaurant as “closed.” But a glance on Seed’s homepage states it is open daily 10 a.m. to 9 p.m. and offers delivery. Does GrubHub have a financial responsibility to Seed for customers who rely upon this false information and then make a purchase from a competitor on GrubHub’s platform? Online takeout ordering companies are using paid search ads featuring restaurants not in business with the platforms. These ads are displayed in search results across Google, Yahoo! and Bing. Their purpose appears to be to confuse customers who are seeking to order food delivery from the restaurant name used in the ad into visiting the respective platform. The U.S. trademarked Border Grill (Reg. No. : 2359331) is an upscale, Mexican eatery with five locations (+food truck) in Southern California and Las Vegas. When the ad title is clicked, however, customers are delivered to the downtown L.A. Border Grill restaurant profile containing no food menu. Here is another example featuring Border Grill. In this GrubHub ad, the display URL grubhub.com/Border-Grill also sends customers to the page with a cartoon-like naked male sitting on a couch. Click the ad title, however, and customers are delivered to the Santa Monica Border Grill restaurant profile with no food menu. 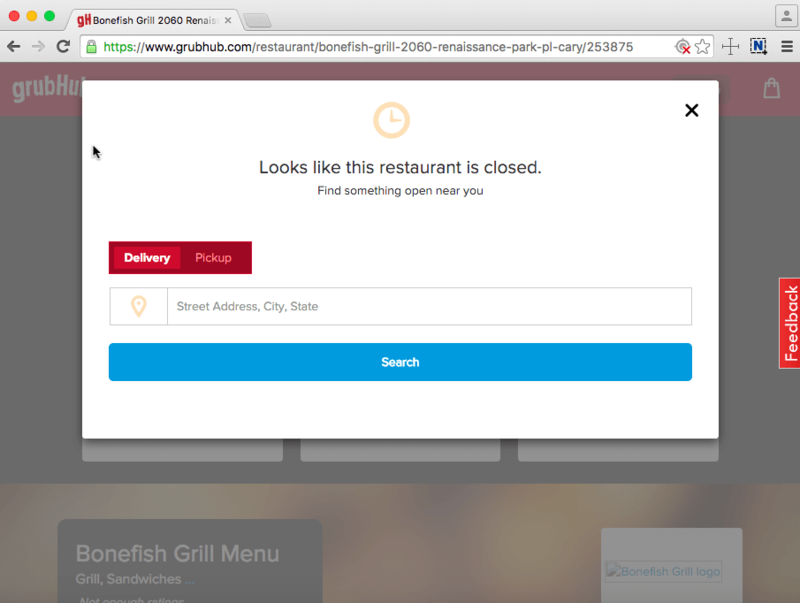 Once landing on either the downtown L.A. or Santa Monica Border Grill restaurant profile, GrubHub’s goal seems to be to redirect a customer into ordering food delivery from a restaurant who is in business with the platform. “…we do obtain authorization to use restaurants’ IP and content,” said a GrubHub company spokeswoman in an emailed reply about whether the publicly-held corporation obtains written permission from all trademark holders not in business with the platform prior to its use of said trademarks in search ads. It is unclear what benefit Border Grill owners Mary Sue Milliken and Susan Feniger would get out of such a one-sided arrangement, but perhaps they will enlighten us in the comments section. Border Grill and Caviar were bedfellows back in July 2014. Alas, the relationship was short-lived. It appears, however, Caviar continues to go after the restaurant group’s customers using paid search ads. Caviar did not respond to an email requesting comment on this practice. In Caviar’s Border Grill ad below, an attempt to visit the display URL border-grill.trycaviar.com by typing it into a browser results in a “This webpage is not available” message. 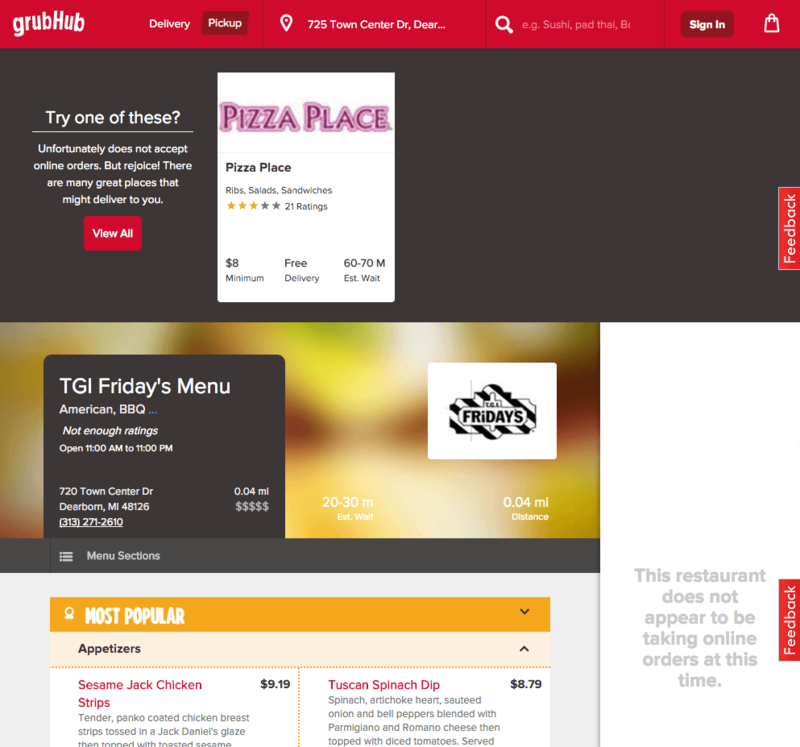 GrubHub’s search ad practices also target national restaurant chains. Ever heard of Chili’s? A click on the ad title sends customers to the Chili’s West Hills, CA restaurant profile. The profile has no food menu. The display URL grubhub.com/Chilis generates the guy on a couch. And here is another GrubHub search ad. It is for Boston Market. 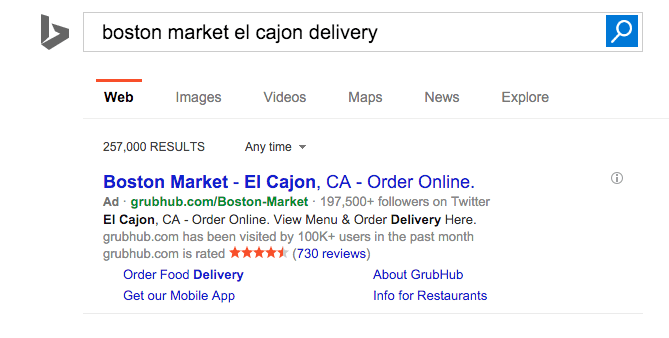 A click on the ad title sends customers to the Boston Market’s El Cajon, CA restaurant profile on GrubHub. Here too there is no food menu. The display URL generates, you got it, guy on a couch. Here is how I protected the James’ Beach brand online from GrubHub, DoorDash, and Postmates in my role as director of marketing and operations for its parent company Bartok, Inc. Arranged for James’ Beach trademark applications (name and logo) to be filed with the USPTO in November 2012 and achieved registration on July 9th and July 23, 2013 respectively. Discovered unauthorized use of James’ Beach trademarks online by GrubHub, Postmates, and DoorDash between November 2014 and January 2015 during online monitoring sessions. Located legal contact information on GrubHub, Postmates, and DoorDash websites and sent trademark cease and desist notices via email, fax, and snail mail until compliance was achieved. Reoptimized James’ Beach website for keywords like delivery, online ordering, and order online to improve page one organic search results for brand while waiting on compliance. All unauthorized URLs, webpages, and meta data referencing the trademarked James’ Beach brand in connection to GrubHub, Postmates, and DoorDash was permanently removed from the Internet. Let James’ Beach serve as proof to a restauranteur’s right to decide whether their restaurant’s name, reputation, and customers can be used to grow another company’s business prior to such use. In a blog entry posted to Medium last month, GrubHub’s CEO Matt Maloney claims to support similar rights. He also writes about the importance of transparency, but actions speak louder than words. Good first steps? Remove the deceptive restaurant profiles from the Internet and revise your search ad practices. Please be sure to share this article with your friends in the restaurant business to help educate them and others on how to protect their brands online. Have you struggled to get unapproved profiles removed? If restaurants’ IP is used without permission to grow another business should it be compensated? Do you think takeout aggregators are good or bad for restaurants? Share your thoughts, questions and feedback in the comments below.